Alexander Solzhenitsyn in “The Smatterers,” from Under the Rubble, p. 273 (author’s italics). Yes, the basis of human civilization is sacrificial love. The Russians seem to have an understanding of this. –the “contemptible amorphousness” i.e. lack of clarity, dissolution, loss of outline, nebulosity – isn’t this characteristic of “liberal” societies – which counteract this vagueness and loss of tone and focus with brutal techno- militarization? –“to set an example”: what great words! what forgotten insight! “rediscover our cultural values”: it is good he puts this in quotes; it shows his sense of irony. but by form of spiritual conduct– (italics last four words) This is the true basis for the “cultural values” and explains the ironic quotes in which he put that phrase. How we conduct ourselves – when is the last time we heard such a phrase – if not from our “victorian” grandmother? The Russians seem to be reappropriating the spirit through the suffering they have been through. But what is America facing but a continuing slide into carelessness – though a refusal to accept suffering, to confront its own ‘dark side”? Thanks for the annotations. Very thoughtful. I read “From Under the Rubble,” when I was quite young…13 or 14…and it made an indelible impression on me. 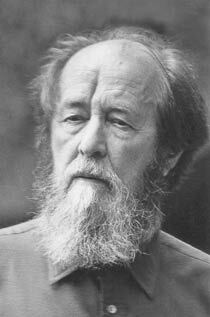 Solzhenitsyn showed how easy it was to manipulate the intelligentsia in a country, “the herd of independent minds,” as some one put it, with a few prizes, accolades, book reviews, prestige…. Easier to manipulate them, really, than other people, because those who deal in words tend to place excessive faith in them. But one man’s words are not the same as any other’s, nor his acts. Words and acts depend for their effect on the quality of being behind them. That’s why students listen to the words of one teacher and ignore the same words from another. Why? They recognize that the quality of being behind is different. That quality is moral force – an incalculable element in human interaction.